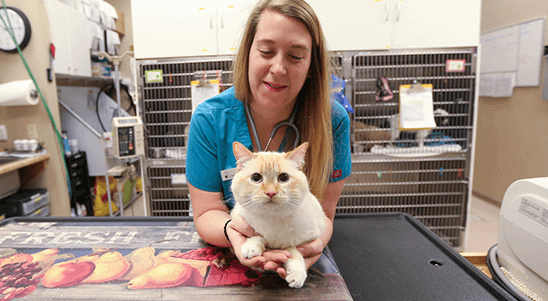 At Poulsbo Animal Clinic, we know cats are special, which is why we have applied to be among the prestigious certified Cat Friendly Practices® in the US. We make many extra efforts to ensure that our cat patients are as comfortable as possible throughout their visits. You’ll notice an area of the waiting room and an exam that is just for your feline friend, with special details designed to provide a positive experience. Our team also stays up-to-date on feline healthcare and ways to improve the examination experience for our cat patients. Some cats are more comfortable being examined in their carrier or in their owner’s lap, both of which we are happy to oblige. We also offer an assortment of cat nip, toys, and savory treats to allow for a fun-filled visit. We make many efforts to help decrease your feline’s fear and anxiety, reinforcing a positive experience while they are in our care. When preparing to travel with your cat, please leave his or her carrier filled with comfortable bedding in open areas for a few days prior, allowing him or her time to acclimate. This will allow for a lower-stress journey to our hospital and back. For more information regarding Cat Friendly Practices ®, visit our resources page.